In December, the BBC aired a documentary about aid convoys to Syria, but – as reported by Gatestone Institute – neglected to inform viewers of the convoy volunteers’ support for jihadi “martyrs,” Al Qaeda operatives and extremist preachers. Although the UK Charity Commission subsequently started an investigation into these charities, the failure of the media to research their interviewees continues to impair efforts to tackle the abuse of British taxpayers’ charitable initiatives. On April 1, Britain’s Channel 4 aired an interview with two “charity workers” in Syria – Tauqir Sharif and his wife, Racquell Hayden-Best. Sharif and his wife work with a number of different charities involved with “aid convoys” to Syria, including One Nation, which is also presently funding a Hamas-run charity in Gaza. …a long history of activism – he was one of those aboard the Gaza aid flotilla which was raided by Israeli forces in 2010. He has campaigned to raise awareness about Syria and met the former Guantanamo detainee Moazzam Begg when Mr Begg visited Syria last year. They were due to speak at a live online “webinar” event about the conflict, but it was cancelled after Mr Begg was arrested and charged with Syria-related offences. Sharif and his wife appear to be part of this dawa’h effort. As Channel 4 reported, the couple “work with a number of different charities, including a project to build an Islamic school for women and children.” Channel 4 failed to report, however, that the logo of the school project, named the Akhwaat Ash Shaam [Sisters of Syria], is the flag of ISIS. 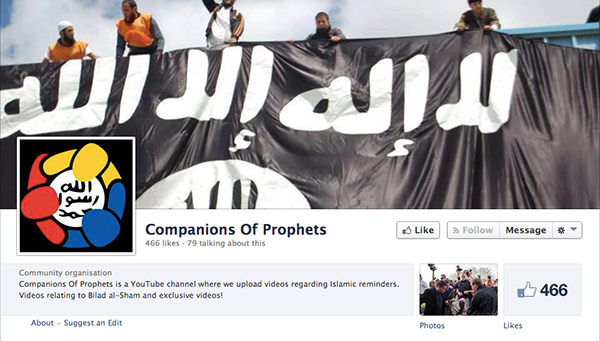 Other Facebook pages established and managed by the couple also prominently display ISIS flags. Posts found on the couple’s Facebook pages include: videos glorifying jihadi fighters; praise for late Al Qaeda leaders such as Abdullah Azzam and Anwar Al-Awlaki; a number of statements denouncing “Yahoodi” [Jewish] oppression of Muslims; openly anti-Semitic posters; and calls for an Islamic state. Although Channel 4 broadcast the footage of Sharif and his wife, it was Bilal Abdul-Kareem, an “American Muslim activist living in Syria,” who filmed the interview itself. In 2009, it was reported that Abdul-Kareem defended the killing spree carried out by Major Nidal Malik Hasan, at Fort Hood in Texas, as an act against an enemy in a state of war. The British Charity Commission is already struggling to keep track of charities that are moving money and people into Syria. Tackling the possible misuse of charitable initiatives for anti-democratic ideological purposes is made harder if the media continues to portray extremists as champions fighting against all odds.